We have observed from previous sections that when first developed, vacuum tubes were used to perform a large variety of roles. However, the rise of more efficient solid–‐state devices subsequently led to their replacement from many of their original applications. More specifically, solid–‐state became and still is, the technology of choice when it comes to low power and low frequency amplification. However, as discussed earlier, tubes can match if not outperform their solid–‐state counterparts when it comes to high power amplification of high frequencies. Consequently a significant number of applications carry on using electron tubes and so whilst they are less visible in our day–‐to–‐day lives, they continue to play an important role in electronics by fulfilling increasingly specialised functions. This section will try to predict what the future holds for this late 19th century technology and more specifically whether tubes will continue to fulfil the specialised roles they are used for presently. Additionally, we will also assess whether recent innovations in technology could result in new or improved types of tubes, which could have practical applications in coming years and thus leads a revival of sorts. After this analysis, we will be in a better position to answer the question raised by this report. 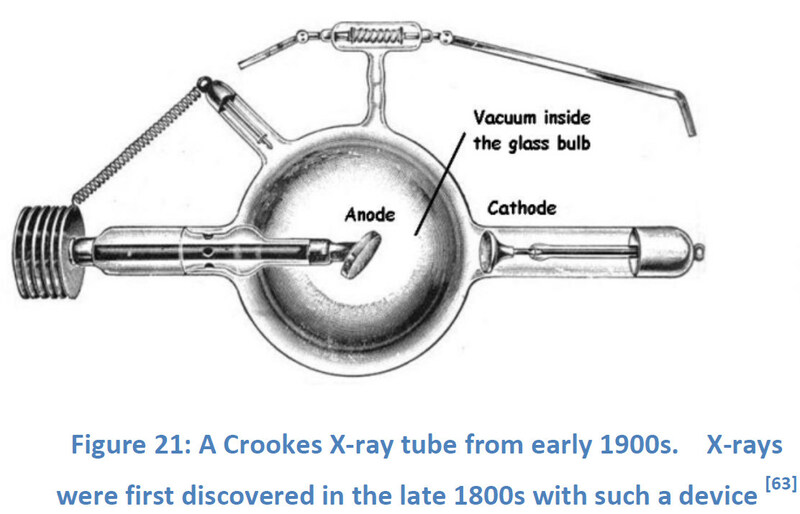 The X–‐ray tube (figure 21) is another extremely important type of vacuum tube that still has many applications these days. Since Wilhelm Conrad Roentgen first discovered the X–‐ray, in 1895, they have been utilised in several fields that benefit society. As X–‐ray generators, X–‐ray tubes therefore fulfil important functions in many areas. However, it is important to note that their applications are still expanding. Consequently, despite it being more than one hundred years old, X–‐ray tubes are playing and going to play an irreplaceable role in many areas including medical and security scanners. 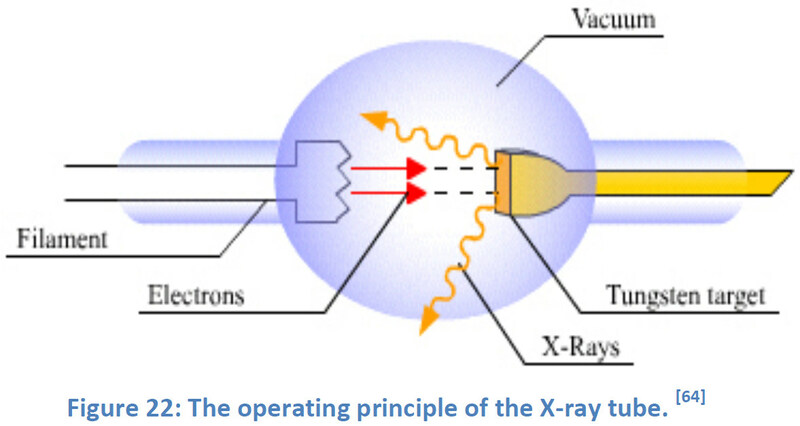 It seems easy to classify the X–‐ray tube as a vacuum tube from the structure. When we look into the process of how X–‐rays are produced, there is no doubt about the above assumption. As illustrated in figure 22, when the filament is heated to several thousand degrees, a large amount of electrons are released from the filament that accelerate towards the anode, which is usually made of tungsten. After the acceleration due to the potential difference of the filament (the cathode) and the target (the anode), the electrons will hit the other atomic particles of the tungsten target and rapidly decelerate. This effect produces Bremsstrahlung radiation, also known as ‘deceleration radiation’; X–‐rays are generated from the anode. Of course, the anode and the cathode are enclosed in a vacuum tube to prevent the filament from burning up and to prevent arcing between the cathode and anode . 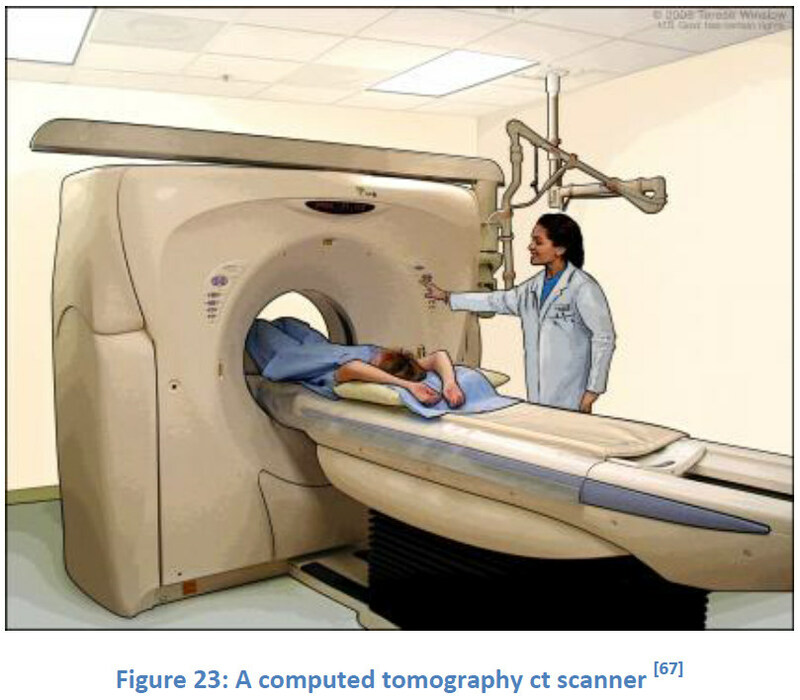 One of the most important usages of the X–‐ray tube in the medical area is the X–‐ray computed tomography (CT) (figure 23). 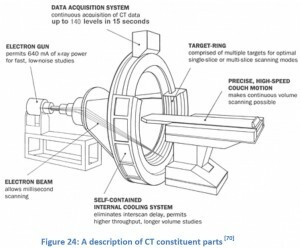 CT is able to produce a large amount of data through a process known as “windowing”, which is able to display various bodily structures based on their ability to block the incoming X–‐ray beams . After that it can reconstruct images mathematically from this data and display them in a digital form. CT was brought into clinical practice in 1972 and has been showing a steady upward trend with respect to technology, performance and clinical use despite predictions and expert assessments that forecasted in the 1980s that it would be completely replaced by magnetic resonance imaging (MRI) . Nowadays CT machines have become one of the most important medical instruments and are used in almost all hospitals around the world. 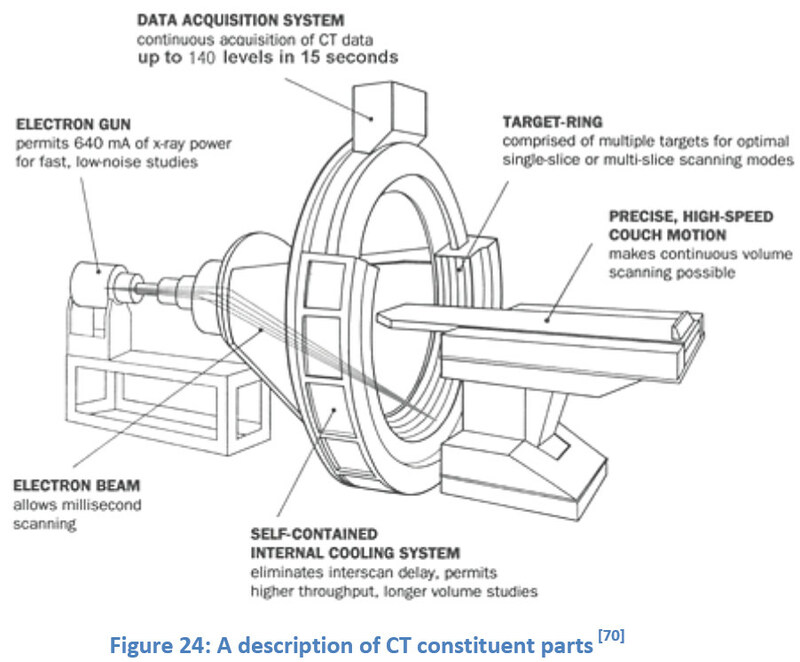 In figure 24, there is an explicit description of the CT machine. CT Scans are important because they simultaneously provide us with very detailed images of bones, different types of soft tissue and blood vessels. Since CT is less sensitive to patient movement than MRI and can be performed if the patient has an implanted medical device, CT will continue to do better than MRI in these cases . They also allow us to look at very thick organs such as the brain, which are commonly scanned using CTs. As you can see from the figure, the electron gun can produce 640 mA X–‐ray beams for fast and low–‐noise studies through the target ring. The X–‐ray tube provides large power X–‐rays to scan the human body and no possible alternative sources have yet been proposed. Therefore, in the future we can see that the CT scanner will continue to play an irreplaceable role in the medical field. As a consequence, so will the X–‐ray tube. Another important application of X–‐ray tubes is in security scanners, usually used in airports. 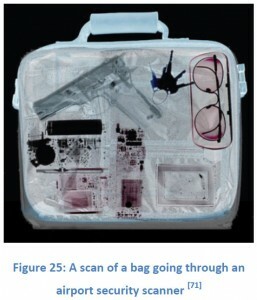 The X–‐ray produced by a prototype airport security scanner can show the shapes of objects in luggage and compare them with the weapon shapes in its database (figure 25). 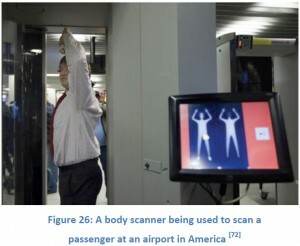 Recently, there has been a shift towards employing body scanners similar to those that scan passenger luggage (figure 26). 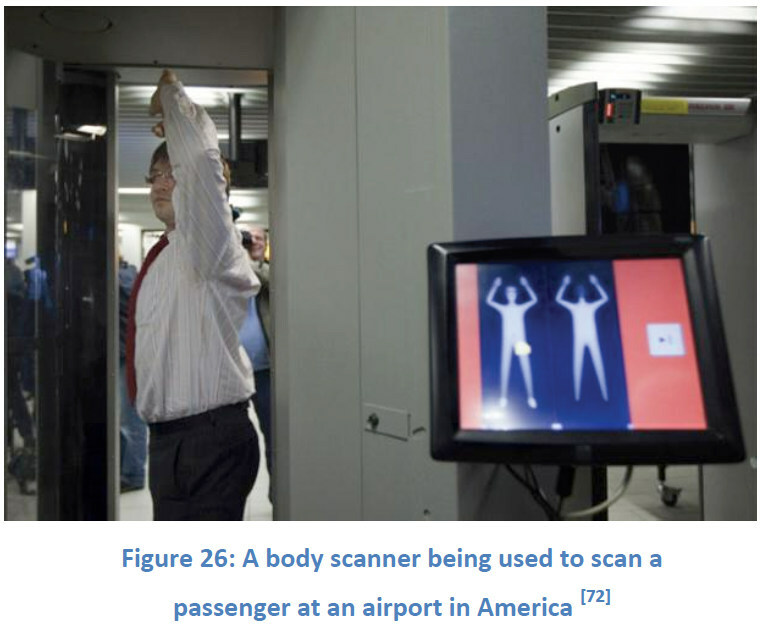 Whilst there is a debate on the violation of privacy that would arise due to such scanners, it would undoubtedly help security guards to prevent people taking dangerous objects onto planes. Thus help avoid another terrorist attack like the 9/11 tragedy. Due to the turbulent social and political climate we live in today, there is a greater demand for improved security systems. This could result in widespread use of X–‐ray tubes as a result. As tubes are slowly replaced from many of their traditional roles, they continue to be utilised in an important and often overlooked field: academic research. Particle accelerators utilize klystrons, as mentioned earlier, that produce microwave radiation that energize particle beams. Accelerators have played and continue to play a vital role in answering some of the most significant questions of physics, because high–‐speed collisions result in particles breaking down into their fundamental components. Consequently klystrons still have an important application as high–‐energy RF sources as a result . This is clearly illustrated by the active development of klystrons by Stanford Linear Accelerator Laboratories in America, who are planning to employ as many as 4000 in their latest accelerator . What is also worth nothing is that there are plans to continue production into the future . In addition to playing a secondary but significant role in accelerators, researchers have recently constructed specially built tubes that could further enhance our understanding of electron spin. The intrinsic quantum spin of electrons, a phenomenon that whilst too complicated for the scope of this report, can be thought to have two states, either up or down. Naturally, this property could be exploited to make a ‘Spin transistor’ , which, unlike modern solid–‐state transistors, would use the spin state rather than or in addition to the flow of electrons to represent information. The arrival of spin transistors could greatly enhance computer specifications–‐ lower power consumption and increased information storing/transmitting capacity to name but a few . However, plenty of obstacles need to be overcome before this technology can become a reality–‐ namely a better understanding of spin–‐dependent phenomenon, in particular an understanding of the interaction of spin–‐polarized electron beams with solid–‐state structures. This is where custom–‐built vacuum tubes are playing a crucial role. Researchers have been able to study these subtle effects and have successfully constructed a ‘spin detector’ prototype . The two setups used are shown below (figure 27). The first configuration was used as a vacuum photodiode that had a variable uniform electric field between its two plates. This allowed it to act as an energy analyser. The diode was able to determine the probability of photoemission from the semiconductor was linked to electron spin and the magnetic field it was placed in. As an energy analyser, the diode allowed the researchers to determine the magnitude and energy dependence of spin dependent photoemission. As a direct consequence of these findings, important semiconductor parameters such as the spin diffusion length could be calculated . The second setup acted as a ‘spin filter’. By introducing a copper micromesh and venetian blind dynode, a device that upon being hit by electrons usually emits large numbers of secondary electrons, in this case actually only reflected electrons onto the anode depending on their spin state. This was due to the polycrystalline oxidized nickel layer added to the surface of the dynode. This filter could thus be considered a ‘prototype of a spin detector’, a device that has potentially large uses in many fields, including the novel field of ‘Spintronics’ (spin transport electronics), which unlike traditional electronics, places emphasis on the spin state rather than the movement of electrons . These two setups were able to provide important results on the behaviour of spin–‐polarized electrons in semiconductor structures, in addition to making a spin filter, which could potentially have commercial applications. Whilst one can speculate about the significance and implications of these findings, or whether they will have any commercial applications in the near future, it is clear that these specially designed tubes were able to provide insight into electron spin. Vacuum tubes possess properties that make them ideal for studying the motion of charged particles; naturally an evacuated chamber allows electrons to travel reach high speeds, but compared to open set ups, contamination of components is also reduced considerably. This results in devices with significantly longer lifetimes . This experiment, therefore, highlights more than anything the important contribution tubes are still making in academic research. They have quietly played a significant role in improving our understanding of particle physics, without receiving the credit they deserve. This is exemplified by J.J. Thompson’s monumental discovery of the electron, using tubes that he constructed . Taking this into consideration, it is therefore remarkable, that over a century later that custom made tubes are again being used to further our understanding of electrons. This demonstrates that at the very least they may still have a role to play in future academic research. Recent advances in ‘cold cathode’ technology may be able to overcome some of the deficiencies of traditional vacuum tubes, which for the most part, rely on thermionic emission to emit electrons. As discussed earlier, this process requires the cathode to be raised to 800°C or higher for emission to begin occurring and as a result has many associated disadvantages . The most important of which is how it determines the size a tube can be shrunk down to; with the cathode at such high temperatures, there is a limit to how close you can place it to the grid and anode. A tube that employs a cold cathode (does not require heating), on the other hand, would be able to overcome these inherent disadvantages whilst maintaining high power capabilities. As a result, miniaturization would be possible, thus eliminating warm up times and allowing operation at higher frequencies (in excess of 10 GHz). Consequently, efforts were made by engineers and scientists to seek alternative emitters as early as the 1950s . The arrival of solid state transistors clearly meant that traditional tubes would only be able to compete if they were adapted and therefore made the need for a different emitter more pressing. Alternatives to thermionic emitters are tubes that rely on field rather than thermionic emission of electrons. Field emission can occur if a large enough electric field is present between the cathode and anode. A sizeable electric field is able to reduce the tunnelling barrier of electrons in the cathode and thus make it easier for them to escape . However, to achieve this requires huge electric fields (in the order of GV/m) or very narrow emitters would have to be used (Fowler–‐Nordheim equation explains what factors field emission depends on). For the last four decades, Spindt–‐type field emitter arrays (FEA) have been utilised in several cold cathode tubes and whilst some of these tubes have been relatively successful, overall they have failed to live up to the large expectations that surrounded cold cathode emitters . 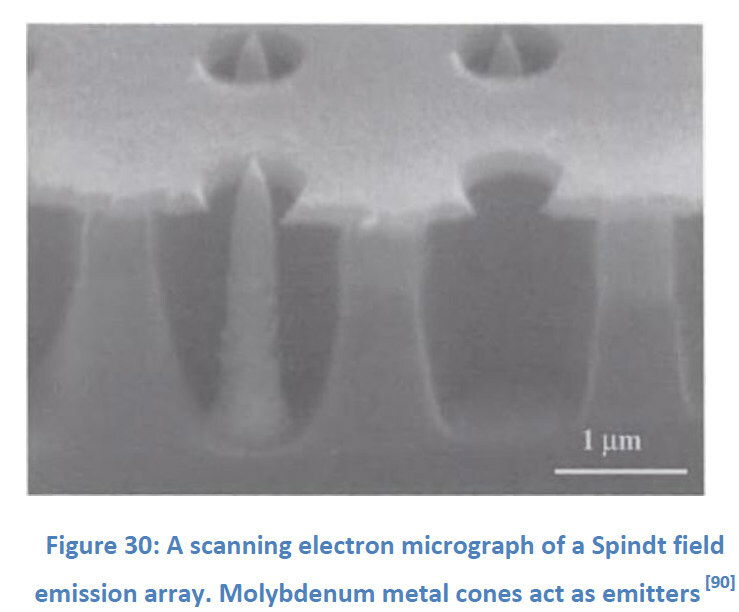 This is primarily due to the unreliability of these devices, which arises from existing micromachining techniques being unable to create hard enough vacuums for the device to operate reliably. As a result the tips are highly susceptible to poisoning over time . Another major obstacle has been the inability to scale up; whilst one emitter can emit large current densities, an array of several thousand cannot produce the expected scaled up amount. This is due to an electrostatic screening effect adjacent tips have on each other; out of the millions of tiny tips that make up an array, only a tiny fraction actually emit electrons . However, with breakthroughs in nano and micro–‐electromechanical technologies, a miniaturized cold cathode vacuum tube has successfully been produced. 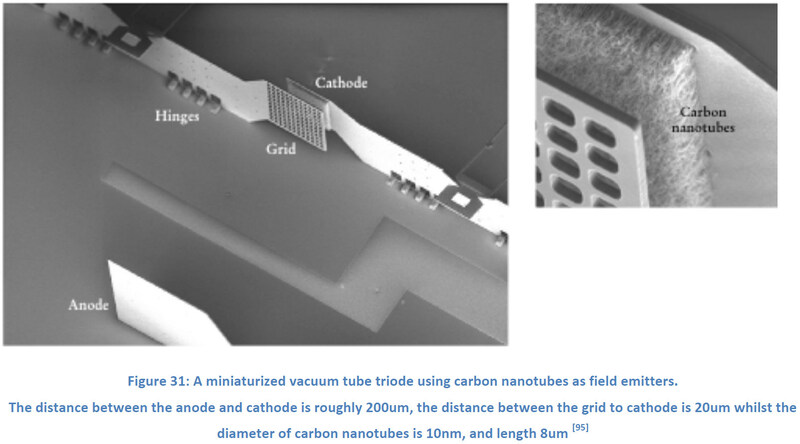 Carbon nanotube arrays are used as cathodes, and since they are naturally very narrow (10nm diameter), this makes them ideal field emitters as they can emit large current densities at low electric fields . The miniature triode is shown below (figure 31). The miniature triode exhibited much of the same voltage–‐current relationships as its larger predecessor (figure 32). However, only modest gains were achieved (in the region of 2 to 4 uS). Furthermore, like earlier cold cathode devices, only a fraction of the nanotubes were able to emit electrons and as a result the device was not able to deliver to its full potential. Whilst these facts clearly highlight that there is a long way to go before this technology will be used in commercial applications, many promising results were presented. 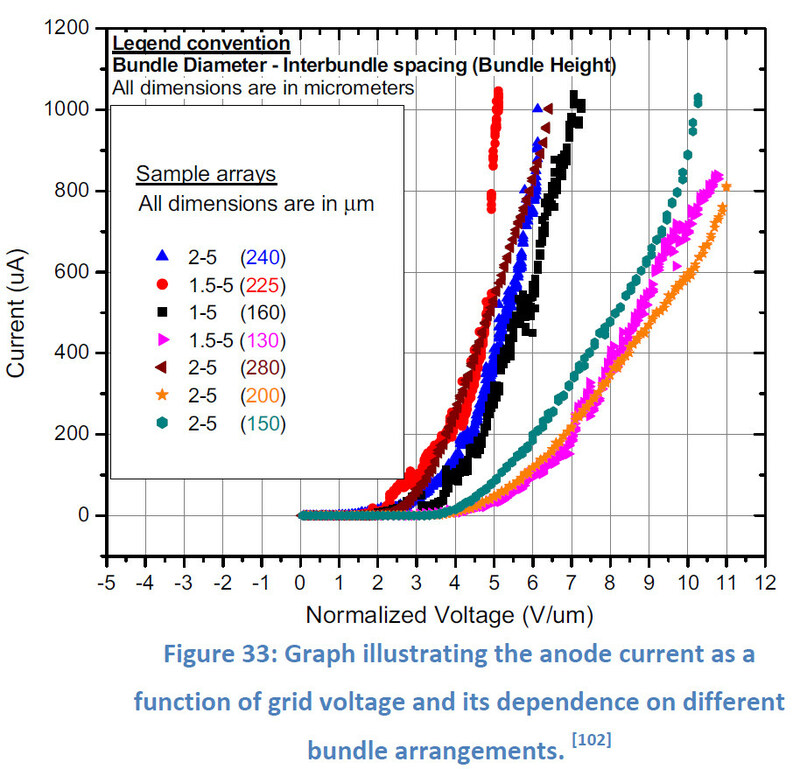 These included a high efficiency (power outputted at the anode is almost 40 times greater than that intercepted by the grid ) and unlike spindt emitters carbon nanotubes have proven to be more robust to poor vacuums . 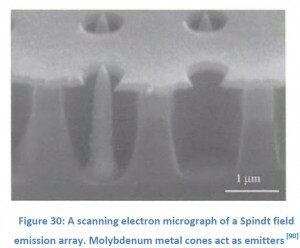 The modest success achieved importantly demonstrates that vacuum electronic devices can be shrunk down to a micro scale. In addition to its initial success, more recent findings have also helped overcome some of the miniature triodes limitations including getting more emitters to emit. 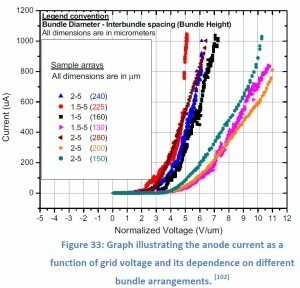 It has been shown that the ‘electrostatic screening effect’ that the mini–‐triode suffered from could be countered by arranging the nanotube emitters in bundled arrays (figure 32). Through experiment an optimum arrangement has been discovered that allows larger current densities to be produced at the cathode . These findings helped overcome some of the earlier deficiencies but problems still remain, such as nanotube emitters being dislodged at high fields due to poor adhesion to the substrate they are placed on . Whilst this technology is still in its infancy and has a number of obstacles to overcome, it seems quite promising. This is highlighted by the continuing work being put in by researchers. In employing field emitters, tubes will no longer have to rely on large amounts of energy for heated emission. As a result, these tubes will potentially be able to overcome some of the limitations of their predecessors whilst acquiring some of the advantages of their solid–‐state competitors. In doing so they could potentially have new applications in wireless communication systems as well as operation in space . However, it is important to make a distinction between these new tubes and their predecessors, the traditional tubes that employed thermionic emitters. They can obviously no longer be regarded as ‘thermionic valves’ as they no longer utilize thermionic emission, however, they still rely on many of the same principles and can be classified as vacuum tubes. The debate about the future of the thermionic valve and whether its use has come to an end is still often discussed. According to our research, we think this is a very complicated question involving multiple points of views. Even within our group, opinions differed. Thus, it is impossible and irresponsible to give a yes or no judgment on the matter. Therefore, we decided to give a well–‐informed verdict that took into consideration all the findings of our research and show you a balanced perspective on the future of thermionic valves. According to our research, in most areas, such as computing, solid–‐state devices have replaced valves. The range of their applications is extremely limited nowadays. From the present section, we have demonstrated that the valve still has superiorities over other technologies in certain domains. For example, in audio amplification, vacuum tubes are adored worldwide by music lovers for their aesthetic appeal and distinct sound signature. They also continue to play an irreplaceable role in high–‐power radio frequency amplifying or transmitting equipment. However, every widely–‐used product is chosen by many factors like efficiency and cost. Once some new technology can replace electron tubes and be economically superior, tubes are most likely to become obsolete. Although there is no guarantee that in the future there will be devices that can achieve better performance than vacuum tubes in these areas. It is also worth noting, that competing technologies have forced vacuum tube designers to improve their operational characteristics. Taking the steady rate of their improvement into consideration, tubes are still likely to fulfil the specialised functions they currently carry out. But even so, the chance for these applications to lessen is much larger than the chance to enhance. In other words, it is quite impossible for thermionic valves to be applied to any more new fields since technical development will never go back. Though enthusiasts, out of love and nostalgia, venture to repeat what their predecessors have done, it is unlikely there will be a second spring for the tube. In this sense, the future of thermionic valves is bleak because they will not have the opportunity to be developed for new applications. Valves, despite making massive contributions throughout their history, still suffer from many of the same disadvantages they did a century ago. These include, among other things, large power consumption. In today’s energy conscious world, traditional valves are therefore unlikely to find their way back into widespread commercial applications. However, besides the specialised functions they fulfil in medical and academic fields, new types of valves could play an important role in the future. Using new technologies such as carbon nanotubes and micro–‐electromechanical devices, new field emitter micro–‐valves can be produced. These, unlike their predecessors, do not rely on wasteful heating to operate. Consequently, they could lead to the expansion of vacuum tube devices in novel applications such as on–‐chip amplifiers and SED monitors. However, it is important to acknowledge that it is very different from the traditional thermionic valves; it employs field rather than thermionic emitters. So despite it having the potential to perform as well as, or even better than competing technologies, the days of the traditional valves that employ thermionic emitters relying on wasteful heating are likely to disappear in the future. As a result, one can argue that traditional tubes, with the exception of certain specialised applications (in which they are more efficient than any competing technology) will be replaced, because they do not meet the energy requirements and the trend of low–‐carbon economy. B. Bernstein. (1959) Vacuum Tube Getter. United States Patent Office. Louis N. Ridenour. (1948) Vacuum Tube Amplifiers, 1st ed., Massachusetts Institute of Technology Radiation Laboratory Series, New York: McGraw–‐Hill Book Company. Alfred J. Cote Jr. and J. Barry Oakes. (1961) Linear Vacuum–‐Tube and Transistor Circuits: A Unified Treatment of Linear Active Circuits, New York: McGraw–‐Hill Book Company. Howe, G. W. O. (1955) The genesis of the thermionic valve. In: Society of Telegraph Engineers. Thermionic valves, 1904–‐1954: the first fifty years. London, The Institution of Electrical Engineers. pp. 11–‐16. Okamura S. ed. (1994) History of Electron Tubes. Tokyo, Ohmsha. p. 98. Redhead, P.A. (1998) The birth of electronics: Thermionic emission and vacuum. J. Vac. Sci. Technol. [Online] A 16 (3), 1394–‐1401. Available from: http://scitation.aip.org/getpdf/servlet/GetPDFServlet?filetype=pdf&id=JVTAD6000016000003001 394000001&idtype=cvips&prog=normal [Accessed 25th November 2009]. Anderson, J.M. (2002) Irving Langmuir and the origins of electronics. IEEE Power Engineering Review. [Online] 22 (3), 38–‐39. Available from: http://ieeexplore.ieee.org/stamp/stamp.jsp?arnumber=00989191 [Accessed 11th December 2009]. Redhead, P.A. (2005) Vacuum and the electron tube industry. J. Vac. Sci. Technol. [Online] A 23 (4), 1252–‐1259. Available from: http://scitation.aip.org/getpdf/servlet/GetPDFServlet?filetype=pdf&id=JVTAD6000023000004001 252000001&idtype=cvips&prog=normal [Accessed 25th November 2009]. Stokes, J. (1982) 70 Years of Radio Tubes and Valves. New York, Vestal Press. p. 10. Appleton, E. (1955) Thermionic devices from the development of the triode up to 1939. In: Society of Telegraph Engineers. Thermionic valves, 1904–‐1954: the first fifty years. London, The Institution of Electrical Engineers. pp. 17–‐25. ANSWERS.COM, Available from: http://www.answers.com/topic/pentode [Accessed 11th November]. Okamura S. ed. (1994) History of Electron Tubes. Tokyo, Ohmsha. pp. 108–‐109. Stokes, J. (1982) 70 Years of Radio Tubes and Valves. New York, Vestal Press. pp. 88–‐89. S. Komm, David and co, (Jan 2001) Advances in Space TWT Efficiencies. IEEE TRANSACTIONS ON ELECTRON DEVICES, VOL. 48, NO. 1, 174–‐176. Gittins, J.F. (1965) Power Travelling–‐Wave Tubes. Bungay, Suffolk, Richard Clay (The Chaucer Press) Ltd. pg. 40–‐56. Awschalom, David & co., Semiconductor spintronics and quantum computation, (USA, 2002), pg. 40. V.L. Alpervich and co. (Aug 2009), “Compact Vacuum Tubes with GaAs photocathodes for studying spin–‐dependent phenomena”, Proc. Of SPIE Vol. 7398 739818–‐1. ibid., Proc. Of SPIE Vol. 7398 739818–‐3, Figure 1. ibid., Proc. Of SPIE Vol. 7398 739818–‐8. ibid., Proc. Of SPIE Vol. 7398 739818–‐1. ibid., Proc. Of SPIE Vol. 7398 739818–‐2. Day, Charles. Researchers Combine Carbon Nanotubes with MEMs Technology to Make a Tiny Triode. Physics Today (July 2002), pg. 17. Zhu, Wei. “Vacuum Microelectronics”, published 2001 (USA), pg. 106. Zhu, Wei. “Vacuum Microelectronics”, published 2001 (USA), pg. 134, figure 4.17. Manohara, H.M. & co. 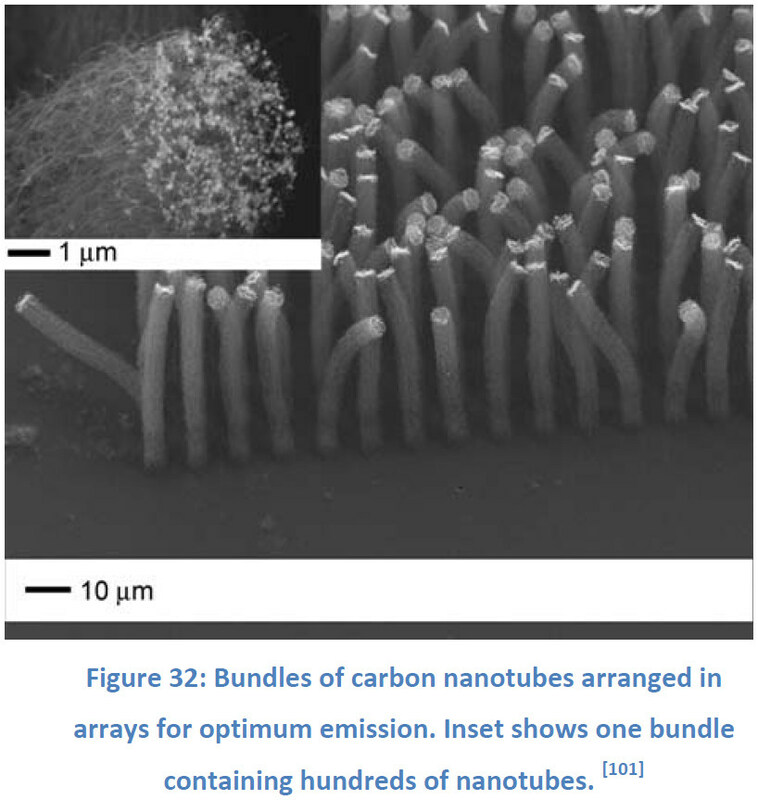 Carbon Nanotube Bundle Array Cold Cathodes for THz Vacuum Tube Sources. J Infrared Milli Terahz Waves (July 2009). Pg. 1339. Manohara, H.M. & co. 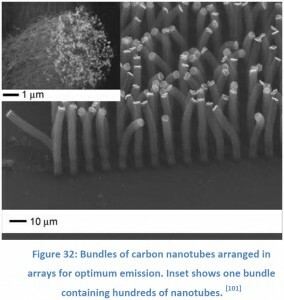 Carbon Nanotube Bundle Array Cold Cathodes for THz Vacuum Tube Sources. J Infrared Milli Terahz Waves (July 2009). Pg. 1341. ibid., pg. 1341, figure 2. ibid., pg. 1342, figure 4.b. Ekaterina Bayguzina: Responsible for developing the past section for both the report and website, more specifically the history and development of the vacuum tube. Qinxin Liu: Responsible for developing the past section for both the report and website, more specifically operation of vacuum tubes and their early applications. In addition was assigned the role of vice captain (run meetings in the event of the group leader being absent). Yunzhi Wang: Responsible for developing the present section for both the report and website. Focus would be placed on existing applications and how these devices worked. In addition, was assigned the role of treasurer and was hence responsible for the ￡50 allowance allocated to us. Ngai-­‐Han Liu: Responsible for assisting in developing the present section, main responsibility was setting up the website. Ye Tian: Responsible for developing the future section, specifically the current applications that would continue to be used in the future. Hamza Javed: Group leader, responsibilities included setting group meetings and deadlines. Also responsible for the future section of the report and website, with focus placed on novel future applications. Contributions: The section below contains statements from each member describing their contribution to the project. It is worth noting, that as a group, we felt all members contributed evenly. Ekaterina Bayguzina: I was responsible for developing the past section of the report and website, namely the history part. A lot of review articles, as well as original patents (e.g. Fleming’s and de Forest’s patents), and electronics history books were used in bringing together all the important events and facts. I also tried to explain the basic operating principles of early tubes, and how the characteristics of the tubes were gradually improved during the 1st half of the 20th century. I used the timeline structure and pictures of the inventions or inventors for the project website. I also wrote the section about Klystron, which is related to the present section of our report. Finally, I contributed to compiling the whole report together, by formatting, proofreading and putting in order all the sections with figures and references. Qinxin Liu: My efforts included writing up the past section, where I mostly focussed on the operating principles of thermionic devices. In addition to this, I wrote the TWT section for the present section as well, where I concentrated on their performance compared to solid–‐state alternatives. I also contributed to the contents of the website; early applications, theory of operation and TWTs. Yunzhi Wang: My contribution to the project included writing the section on present day applications of vacuum tubes. I wrote about magnetrons and cathode ray tubes. I explained the operating principles of these devices, as well as compared them with competing technologies where possible. In addition to my work on the report, I helped compile the different sections of the report together with Ye Tian and Ekaterina. I also utilised the financial allowance we were provided by using it to print out our report. Ngai-­‐Han Liu: My contribution included writing the section on present day applications of vacuum tubes. My section focused on alternative displays to CRTs, as well as sound and transmission methods using vacuum tubes. I also edited the present section and improved the standard of English (being a native speaker). My main contribution was, however, in the form of the website. Where I designed and developed an original website template. This included pure CSS formatting and a Flash timeline as well as a navigation menu. I also arranged the content for the present section in the website. Ye Tian: For this project I was assigned to work on the future section of the report with our leader Hamza. 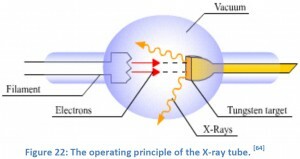 My main contribution was to the X–‐ray tube and its possible future application. I also worked on the first draft of the final conclusion. Besides the future section, I helped combine all the subsections from each subgroup into one report. Hamza Javed: As leader of the group, a lot of my contribution to the project was to manage and keep track of our work. I was fortunate enough to have a highly motivated and enthusiastic group of people to work with, and so was able to perform my job with relative ease. In addition to managing the group, I contributed to the future section, focussing on the novel applications such as cold cathode vacuum tubes using field emitters and tubes in academic applications. I also assisted Ngai–‐Han in adding the content of the website (future section) and once the report had been put together, edited, formatted and proofread it until our final draft was produced.